19th-century (?) calf, gold-tooled, preserving on spine remnants of earlier gold-tooled binding. 207 leaves (1 column, 15 lines), bound : vellum, ill. ; 130 x 75 mm. William Salloch, Pines Bridge Road, Ossining, New York (dealer's label on end pastedown); E. Clark Stillman Collection. Ms. psalter; written and illuminated in Belgium, Antwerp, 1551. 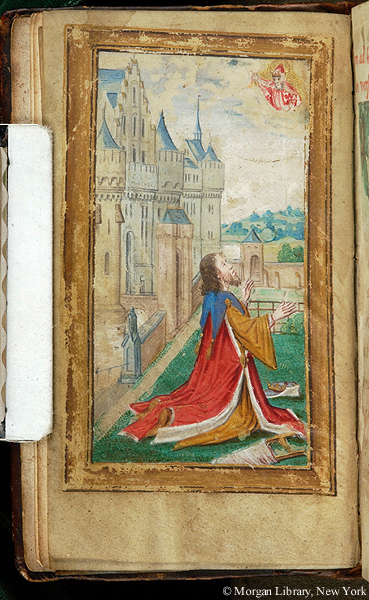 Decoration: 1 full-page miniature, David at prayer. Collation: 2 paper + 3 vellum [middle one a stub that probably had owner's name, other data] + 207 + 5 vellum + 3 paper. Fol. i-verso has numbers, some type of accounts; ii is the stub; iii has an inscription in Greek at top of page and TEMPORE TE' TEMPERA mid page; iiii is blank on recto, full-page miniature of David at prayer on iiii verso. Psalter text ends fol. 199v with 2 words in Hebrew. On last vellum leaf is written: Anno C? ALUTIS HUMANAE SUPRA SESQUIMILLESIMUM QUINQUAGESIMO PRIMO STILO BRAB. ANTWERPIA 27 QUATERNJ. An early description of this manuscript assigns it to use of Antwerp.